The RCF ART 312-A Mk4 is an 800 watt, 2-way speaker delivering fantastic sound from a 12” woofer in a conveniently versatile enclosure. A .. The RCF ART 312-A Mk4 is an 800 watt, 2-way speaker delivering fantastic sound from a 12” woofer in a conveniently versatile enclosure. The RCF ART 3 speaker series comes back in its Mk 4 iteration. A brand-new classic, this loudspeaker has been re-engineered, retaining the original 1996 concept but with cutting edge technology. With the RCF ART 312-A Mk4, you get excellent sound quality and incredible power in a convenient unit. RCF’s woofers and compression drivers are precision engineered. Combining their decades of experience with cutting edge technology, the transducers used in the RCF ART 312-A deliver incredible performance. With proprietary, advanced FiR filtering technology, the ART 312-A produces beautifully transparent sound with incredible clarity. Equipped with special FiRPHASE filters, this active speaker produces consistent and coherent distribution of sound for your entire audience so they can enjoy your music without phase distortion and with minimal system latency. In order to give you great results from a lightweight, convenient package, the RCF ART 312-A Mk4 features a Class D power amplifier technology. Since they are made with a solid mechanical aluminium structure, these amplifiers are stabilised in transport and dissipate heat without a fan. Sporting an SMPS power supply section, the amplifiers in the RCF ART 3 series deliver huge output with minimal transportation weight. With these combined factors, the end result are amplifiers with amazing attack speed, fantastic transient response an all-around incredible audio performance. 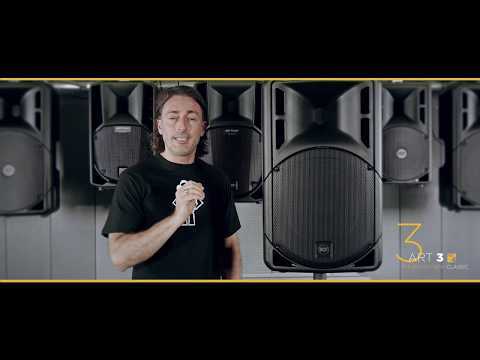 This active speaker is designed for live sound reinforcement suitable for clubs, theatres, music venues and corporate events. You can even use the ART 3 312-A as a stage monitor. Because of the cabinet’s rear profile and internal reinforcement, you can easily use the ART 3 speaker as a wedge monitor while performing. The Cabinet of the RCF ART 312-A Mk4 is moulded from a polypropylene composite material which dampens vibration, even at maximum volume, ensuring you have distortion free sound. The ART 3 also boasts a plug and go design with XLR and jack inputs and a single volume knob. Whether you’re a musician or sound engineer, the simplicity of the ART 312-A is ideal for quick setup and easy use. Designed for maximum reliability and built to withstand intensive use, the ART 312-A is perfect for taking on the road. It even comes equipped with integrated handles for increased portability! Buy the RCF ART 312-A Mk4 2-way speaker from PMT Online and get fantastic audio from a convenient and robust unit.